Phicus at Robadors 23 – “Keiji Haino meets AMM”? Why “Phicus”? What is a phicus? A fancy spelling of the plant? Or is the explanation more elaborate? I suppose I’ll have to ask… but in a post-truth society, it’s more fun to guess or fabulate… #phikenews? 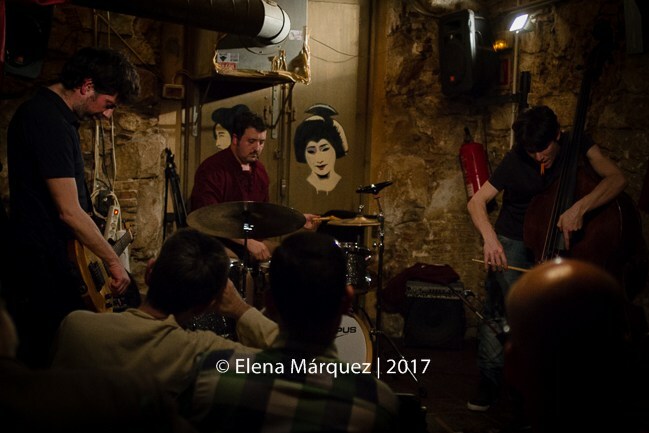 Well, whatever it means, what it is… is a new trio in Barcelona, comprising three beyond-busy stalwarts of the free improvisation scene. I was already tempted to check them out but when they described themselves as a “Keiji Haino meets AMM” kind of thing, that clinched it. So is it a good description? With a samurai unhesitancy, they plunge directly in – clang, rumble, and clatter – with plenty of power, an absence of fear, and manage to avoid both cliché and repetition. So far, so good. Fages utilises a nice big open, distorted tone, plenty of hollow twang beneath the grit and grumble; every touch of a string provokes a clear presence. The dry tremor and hiss of Trilla’s kit is a systematic, almost scientifically accurate beating; you never know where the next blow is going. And Reviriego ranges from incoming storm front to introspective arco, shifting from act of god, to querulous plaint, to aching groan. It’s a no holds barred pleasurefest of soundplay, matching and contrasting tones and textures, introduced, layered and discarded in an unstoppable kineticism. In other words, it’s pretty bloody exhilarating to listen to. A recording please, and soon. One Response to Phicus at Robadors 23 – “Keiji Haino meets AMM”?